Love pond hockey, backyard rinks, youth hockey, or the grassroots versions of our great game? Enjoy writing? Want to share your talent and knowledge with the tens of thousands of readers we get each month? You’re in the right place. Starting in September 2013, we’re expanding to more of a magazine format, whereby we’ll take submissions from freelance writers like you, all in an effort to grow our little hockey niche across the globe. It’s impossible for one single person to know all there is about outdoor hockey, so I’m opening up the pages of this website to everyone, in the hopes that you’ll consider sharing what you know with our readers. Our primary mission is to grow the game of hockey by speaking freely of our passion, our experiences, and our love for the game. We eat, sleep, and breathe the game of hockey, and it is our sincere hope that our words will help ignite that passion within you, our readers. I’m creating this FAQ page in the hopes that it addresses all of your questions. If I’ve left anything out, please use the Contact Us page to ask your questions. And of course, when you’re ready to sign up to be a contributor, use the Contributor Sign Up Form. This blog revolves primarily around the outdoor brand of hockey. It started with backyard rinks, expanded to pond hockey, and we’ve dabbled in youth hockey and the relationship we have to professional hockey at times as well. Ultimately, many of us are drawn to the purist side of the game, and it’s this lesser-known outdoor cousin that we want to focus on. Basically, if you can tie it back to outdoor or grassroots hockey in some way, you’re good. Can I write about my product or event? Maybe. This is a slippery slope, and we’ll handle it on a case-by-case basis. I am fine with a product link or event mention, provided you can answer the following question: if you remove the product or event link, is the story still worth posting? For example, if you write a story about how to keep your skates sharp during a pond hockey tournament, and one of your several options is to use a handheld skate sharpener you happen to sell, that’s fine provided there are other options or pieces of information out there. If you wrote a story and the only thing you talked about was your skate sharpener, then that would be rejected. Similarly, if you are writing about pond hockey and you mention your own tourney, that’s fine so long as its not central to the post. If removing the name of your event eliminates 50% of the content, then chances are we’d reject it anyways. Backyard-Hockey.com IS a place where we can share ideas, lessons learned, and interesting anecdotes. It’s not a Craigslist ad or a place to post your latest press release. (Side note: if you DO want to advertise on the site, please contact me directly). But I’m a terrible writer! Maybe, maybe not. Heck, I work for an insurance company and build rinks…John Grisham I am not. But I don’t need to be, and neither do you. Passion, experience, and expertise with some grammar errors will lead to way more readers than a well composed sentence that’s boring. Besides, we can help you fix it if it really needs some help. So let your creative juices flow and leave the punctuation up to us. I submitted a post but don’t see it on the site. Where is it? Contributors to the site will be able to log in and write their own posts, but once they’re saved, it will be up to us to proofread, edit, and schedule the publication date. We’ll do our best to communicate these milestones to you as we go. It won’t let me post pictures! This site is run on WordPress, which does not allow contributing authors to include images. I have no idea why, but no worries — we’ll add images to your post before it goes live. 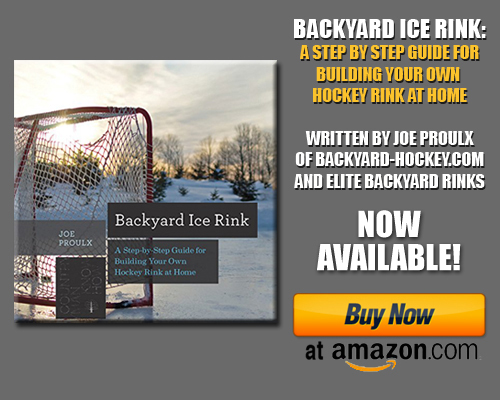 If you have images that you want to use with your post, by all means send them to joe@backyard-hockey.com as soon as you submit your post. Superb internet site. Plenty of helpful tips listed here. I am submitting the item to several associates ans furthermore giving with delicious. And obviously, thanks a lot in your hard work! I would be interested in doing pieces for you site based upon my experiences of building 46″ x 94″ backyard rink to support some local children’s. Over the past year, I built up quite a list of lessons learned that mig of interest to others. See http://www.reasonfortherink.com for details on my rink.